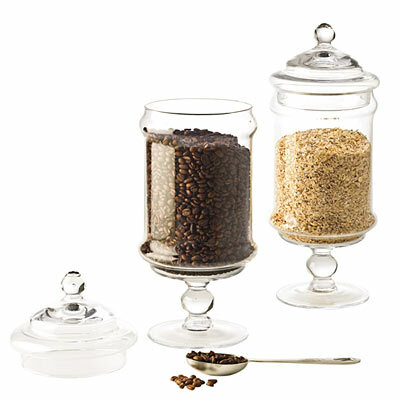 Apothecary jars are perfect for creating personal homespun gifts for almost every occasion. You can fill them with treats and sweets for Valentine’s Day, Thanksgiving, Mother’s Day, or as a unique party favor or wedding giveaway. You can put candles, potpourri, flavored teas, coffee beans, bath salts, colored soaps, herb-infused oil, cookies and even plants. But the fun doesn’t end there. 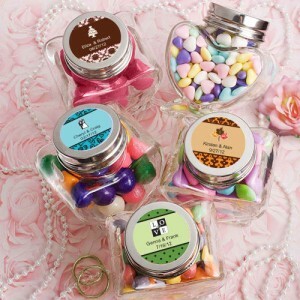 The fun continues as you design these jars and make them prettier, more one-of-a-kind and good to go for gift-giving. The easiest way to embellish these apothecary jars is to tie a pretty bow around it. Ribbons come in fancy colors and others come even in floral prints and dots and everything else in between. 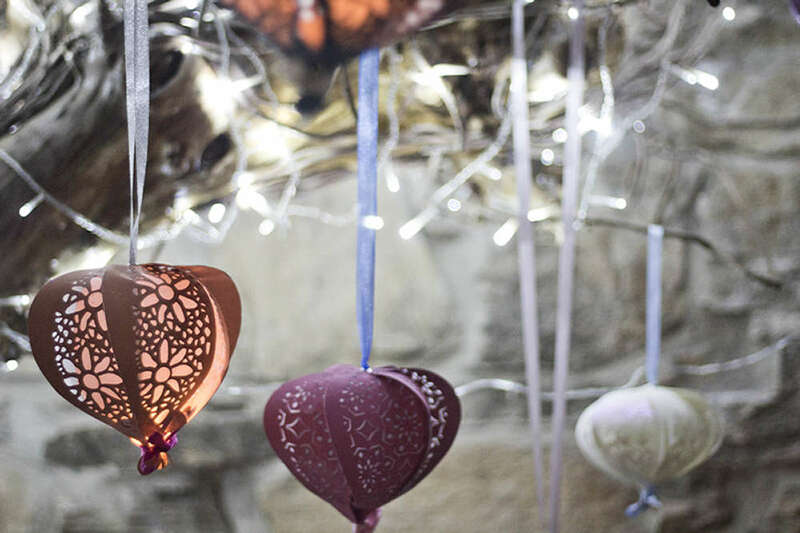 If you want to achieve the rustic look, use brown strings and cute tiny ropes. Use different laces and beads to make it even fancier and prettier. Making personalized stickers that look like labels is another fun way to design your apothecary jar. Pick out quirky and fun sticker labels to add more whimsical touch to your apothecary jar gift. Or choose the simple elegant type of stickers to achieve the classic look. You can also use 2D stickers and not the regular flat ones. Like cushioned letter stickers and the like. Gift tags don’t have to be the classic paper. It’s time to depart from the norm, and try use other materials. Like chalkboard tags – cut out small chalkboard tags and write down your message with a colored chalk. An illustration board is a great way. 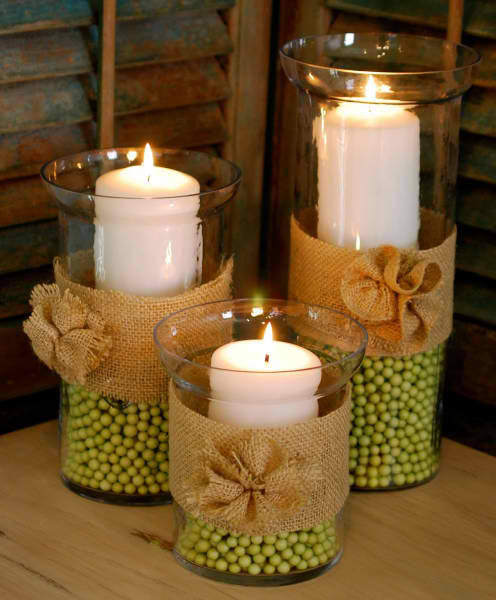 Tie them up with some burlap ribbons and prettify it with some fancy colored buttons or beads. Knitted and cross-stitched tags will surely bring the words “personal” and “heart-felt” more tangible. You want to make your apothecary jars really pretty but you don’t have the skill to knit and stitch? Don’t despair. Schlep to the nearest craft store and grab some ready-made crafts like bunny-shaped or heart-shaped gift tags. Add more fun factors, by putting googly eyes. Give more fun, texture and color to your tags without really breaking much of a sweat by using cute items in a craft store. Think about the oodles of fun you’ll have and watch the excitement in the eyes of the person who will receive your pretty gift jar. This is really fancy and a bit expensive than the others. But if you want to give a gif that will last a lifetime, then a glass-etched apothecary jar is perfect. You can feature wonderful etched sayings on the front or some fancy art work, or their personal names and other designs. Whether you use cork lids, bell-shaped lids with pretty knobs as your jar cover, you will surely have a fancy design on your apothecary gift jar. Pine cones, seashells, twigs, flowers, leaves. Nature has a lot of wonderful things that you can use to embellish your pretty apothecary gift jars. Just let those creative juices go a-flowing and have fun. Why is it apothecary jars appeal so much to crafters? Perhaps it reminds us of all the pretty little odds and ends we keep here and there for our projects. Apothecaries were once what we would term pharmacists and more, keeping their herbs and concoctions handy in little jars next to the mortar and pestle. Or perhaps on display in their quaint shops, waiting for patients in need of medical advice and a remedy of fresh lavender, feverfew, or fennel. Although vessels termed apothecary jars actually date back as far as ancient Greece, Babylon, and Egypt, the glass containers sought by today’s collectors date back no later than 15th century Europe. Many were simple glass jars designed to be used by anyone in need of storage, while others assumed a more decorative role with creative ornamentation. Some had ground-glass stoppers for keeping their contents sealed iin fresh. By the 19th century apothecary jars came in a wide variety of colors and could be labeled with their contents or what ailments they were meant to treat. Today’s apothecary jars are mainly ornamental, sometimes seen in pharmacies to recall their origins, or used for decorating any space where pretty shapes and colors are needed. Hobby and decorator shops sell empty apothecary jars at low prices, and decorating them yourself will give your arrangement your own unique style. 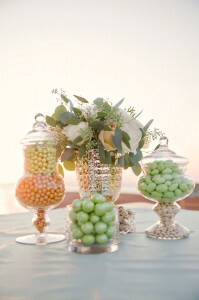 For a traditional look, arrange at least three jars of different heights and shapes. 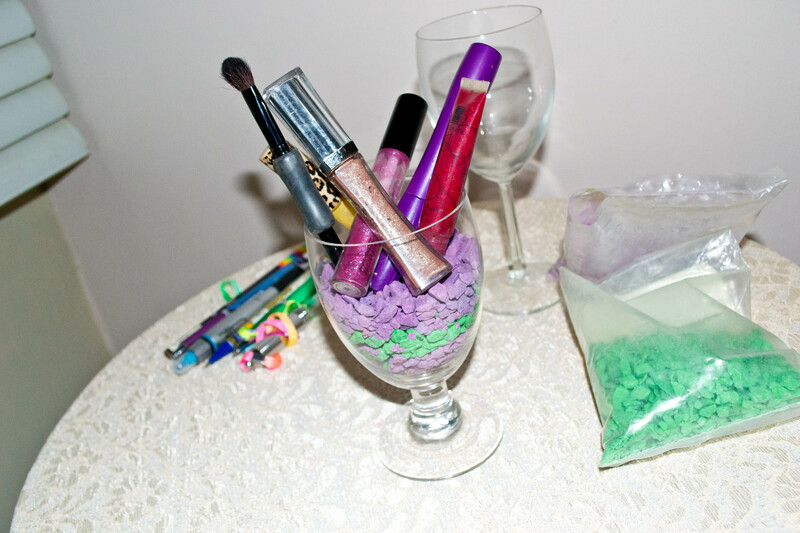 For an unfussy look, fill with colored water, colored sand, or seeds. 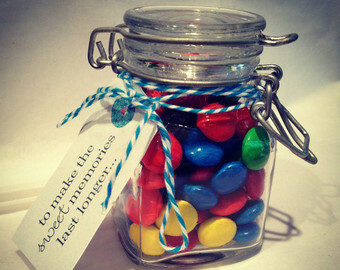 Keep in mind where your jars will go. Use contrasting colors to make your design stand out. If you have a blue wall, for instance, try filling your apothecary jars with eye-catching yellow or orange. If your taste runs to whites and beiges, fill your jars with your favorite bright colors to make them the room’s focal point. 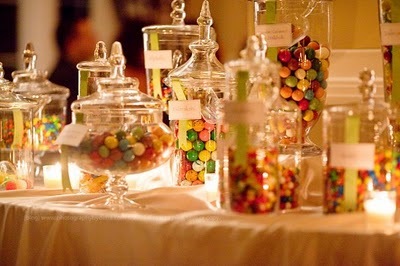 For a fun look, fill your apothecary jars with candies for a party or reception or use them as cookie jars. 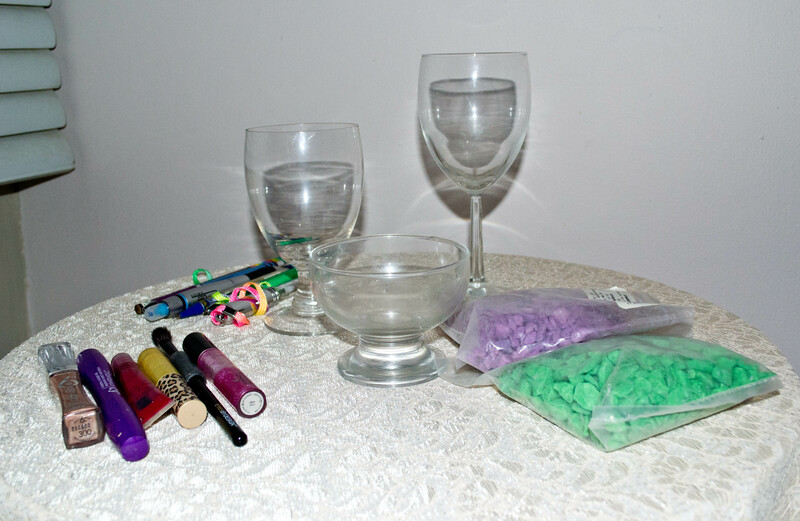 Materials you would use for other crafts projects can be pretty in themselves. Fill a large apothecary jar with ribbons still on their spools. Choose all the same color with different sizes and textures or different colors with the same texture. . Another jar might hold a collection of buttons of all sizes, shapes and colors, while a third jar in your arrangement might hold colorful balls of yarn. The arrangement would be perfect for your crafts room or family room. Fill with guest soaps to make your guests feel welcome. If you like the natural look, find some interesting bark such as sycamore or birch and arrange it along with some moss. Add colorful pebbles and dried flowers and tie a bow around the outside of your jar with raffia. 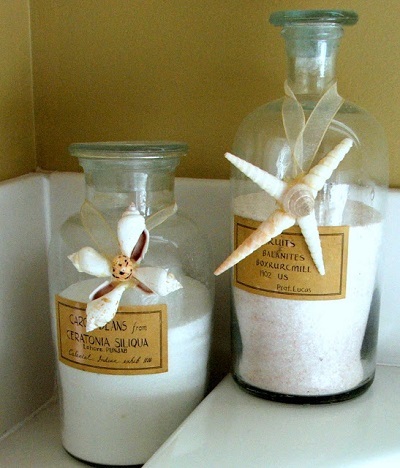 If you live at the beach or wish you did, fill your apothecary jars with natural-colored sand (either from the beach or from a pet shop) and add shells you have found at the shore. Stand curly willow twigs up in your sand for the look of a tiny beach in a jar. Apothecary jars lend themselves to floral arrangements, with either fresh flowers, permanent botanicals, or a combination of both. Fill a jar with water and gently push a sprig of orchids completely under the water. This simple but dramatic arrangement is always impressive as it is easy to make. Floral foam is an aid in making more complex arrangements. If you use colored, or rainbow, foam it becomes part of the design. 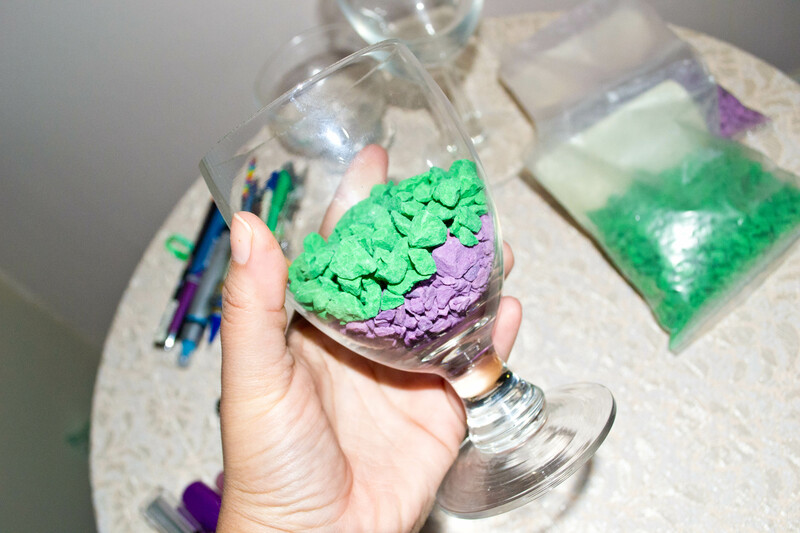 If you use drab green foam you will need to cover it with foliage, moss, colored paper, or powdered colored foam. Soak a piece of floral foam in water until it is slightly submerged. If you are using drab green foam cut it to a size that will fit into the bottom two inches of your apothecary jar with room on all sides. Cut fresh flower stems an inch from the bottom, at a slant. Place tall stems in the center of your container and arrange shorter stems all around. Make a paste of some powdered floral foam and press it around the inside of your jar, making sure to hide all the solid foam from view. If you use permanent botanicals there is of course no need for water, so you can use Styrofoam at the bottom, taking the same care to hide it from view. 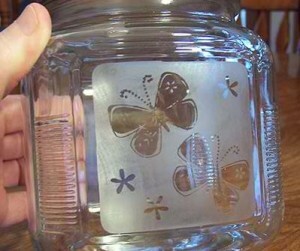 Turn your lid upside down and make a similar but shorter arrangement into it, then place it, still upside down, onto the top of your jar. Apothecary jars by their nature evoke a feeling of cuteness and tradition, but there is no reason why they cannot be used for modern decorating as well. For a dinner party place a row of cylindrical apothecary jars of the same size full of colored water down the center like a row of soldiers. This will fit in with a modern glass home. To add drama, place a long mirror or runner beneath your jars. 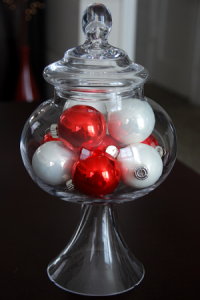 Apothecary jars can hold holiday decorations which you can rotate with the seasons. For thanksgiving fill your jars with fall-colored leaves. Stand little pilgrim statues next to them. For Christmas use poinsettia and pine needles with white flocking, or fill with Christmas tree ornaments, Cinnamon sticks, Christmas candy, and gingerbread people go well too, and will look nice in the same room with a gingerbread house. For Hanukah alternate blue and silver layers of glitter from top to bottom of your jars and stand next them to the menorah. Make a gift of an apothecary jar by layering various kinds of coffee or tea through an apothecary jar and tie with a gift bow. After the recipient finishes the coffee or tea he or she will have a lasting decoration. At Easter fill your apothecary jars with lavender and yellow flowers or colored eggs and stand a bunny nearby. For a Mothers’ Day gift fill an apothecary jar with potpourri or permanent rose petals. For the Fourth of July your apothecary jars can hold red, silver, and blue stars. I hope the above ideas have inspired your imagination. Now create something uniquely your own with your apothecary jars. Go to it. Besides being easy to grow, air plants lend themselves well to indoor or outdoor decor, and can be moved without any fuss. Air plants, or tillandsia, are epiphytes, which means that in nature they grow on other plants. Fortunately they are not parasitic, so have no worries about placing your air plant onto some other plant. Air plants use their roots only as anchors, taking in water and nutrients through their leaves. On the other hand, other plants are not the only place where air plants can put down their roots. Clear plastic hanging containers are a popular place for air plants. 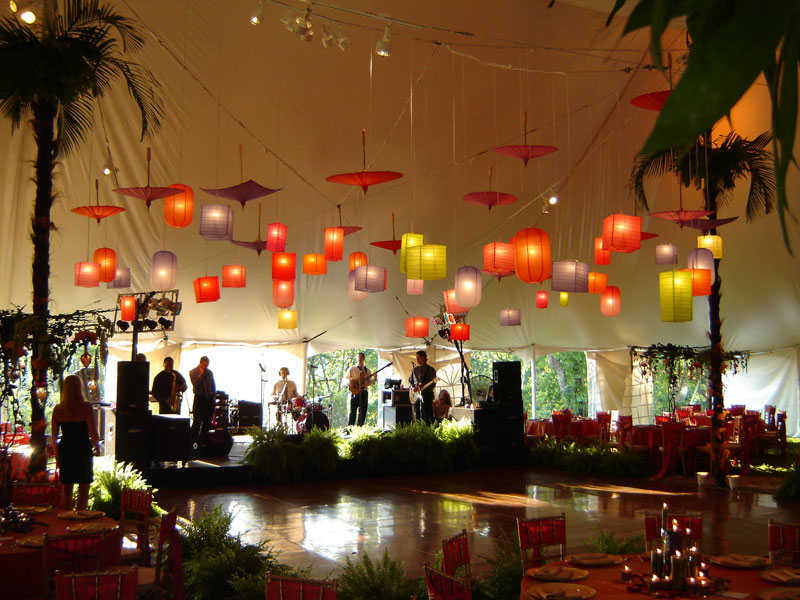 They give any room a light, natural look and can be moved when you feel like changing the decor. Such containers are available in teardrop or spherical shapes, and a group of them makes an interesting statement. Try differently shaped hung at different lengths with different species of air plants for variety. A terrarium offers a good place to make an arrangement of air plants. Fill your terrarium with sand for a natural look . Add some pretty rocks and place your air plants onto the tops and sides of your rocks to make a little world where you can take a micro vacation meditating. 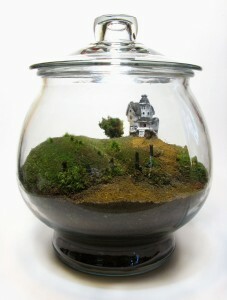 Be sure that your terrarium has some open places where air can circulate. Do not use soil or any other medium that will hold in water. Make modern art with the use of opaque vases or clay pots. 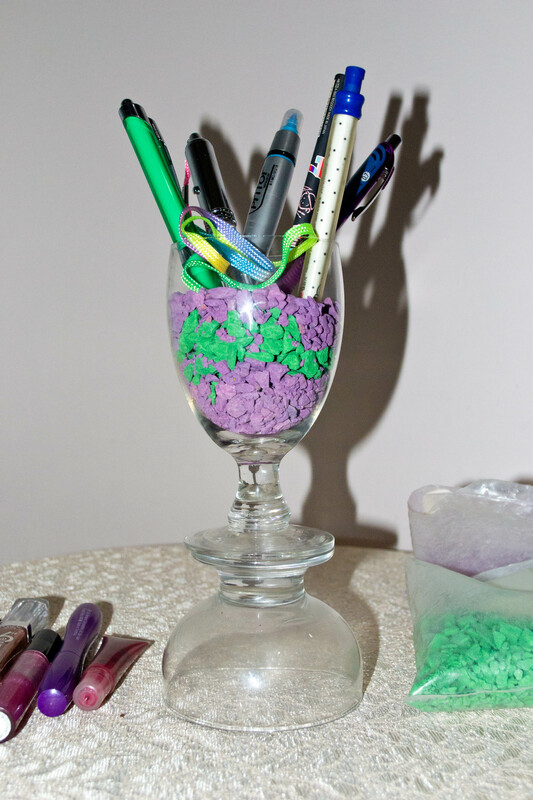 Fill your vase or pot with styrofoam and insert a wire vertically through the center so that it sticks up. Twist the top of the wire gently around the bottom of an air plant. Leave at least an inch of wire between the container and your plant. Cover the styrofoam with gravel, moss, or acrylics. Your plant will appear to float above the container. Or construct a living wreath for all seasons. Start with a basic wreath made of grape vine, straw, or man made material. 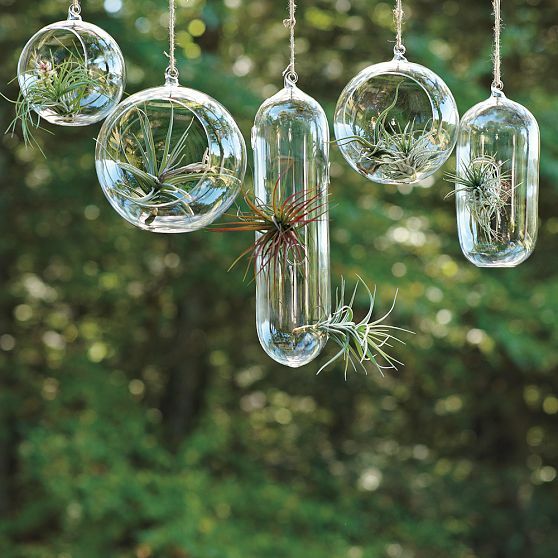 Gently wire your air plants all around. Use other natural materials such as seeds, shells, or dried flowers to give your wreath more interest and texture. You can decorate it throughout the year with colored ribbons or raffia for varying seasons and holidays. In the spring glue on brightly-colored Easter eggs. 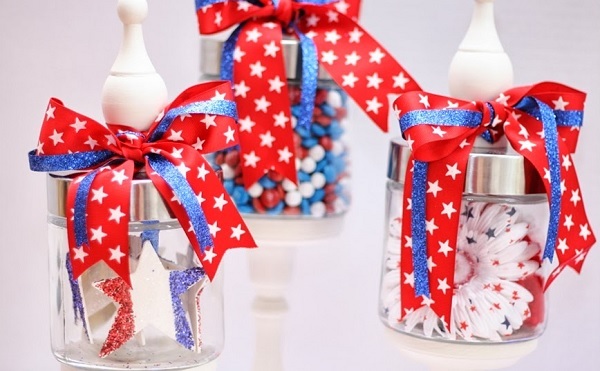 For Fourth of July use red, white, and blue bows. In the fall wire or glue on either freshly- fallen leaves or permanent botanical leaves in autumnal colors. For the look of a country cottage use burlap ribbon. For a more urbane look use simple smooth or metallic ribbon. If you have an epiphytic orchid mounted on driftwood or some other attractive wood, air plants look nice beside it and are compatible because both thrive under the same conditions. If you use wood be careful not to get it too wet and cause it to rot. Any non-copper surface is fine, so be creative. Make an air plant mobile using coat hangers, steel wires, or fishing line and glue your air plants onto it. You can use artificial nail glue, hot glue, Goop, or whatever is available at your favorite crafts store. Which brings us to environment. Air plants do well in 50 to 90 degrees Fahrenheit, or about room temperature. They can do nicely outside in a mild climate or do well as house plants for home or office. Even air plants need watering, which should be done 2 to 3 times per week. Either allow them to float for 20 to 30 minutes in a water bath or use a mister. If you use the former method, do not allow the flowers to submerge as they are delicate and can break. After their bath put your plants onto a flat surface where they will dry in about 4 hours. Air plants can live in a bathroom but still need to be watered because the water vapor from a shower only lasts in the air a short time. Air plants are related to bromeliads, so bromeliad fertilizer can be added to your mister or water bath about once a month during the plants’ growing season, from spring through fall. If bromeliad fertilizer is unavailable, a commercial fertilizer such as Miracle Grow can be used at ¼ strength. While fertilizer is not strictly necessary it will help your air plants to grow and bloom. Air plants need bright but indirect sunlight, so plant near a window that gets some sun but where your plants will not be burned by direct exposure. Fluorescent bulbs are also good. Air plants occasionally need grooming just as other plants do. When a leaf or root dries out or becomes brown, gently remove it with a pair of manicure scissors, cutting on a slant for a natural esthetic look. Air plants reproduce by two methods, by seeds and pups. Flowers produce the tiny seeds, which are usually contained in a small pod that dries and turns beige when fully ripe. Pups are smaller plants produced next to the mother plants. They can be removed and replanted elsewhere when they are about one third the size of the mother plant. Growing air plants from seed is not difficult, but it does require patience, as the seedlngs take 2 to 3 years to show enough growth to transplant. A fine plastic mesh or a nylon stocking stretched over a frame will provide a good platform for your seeds. 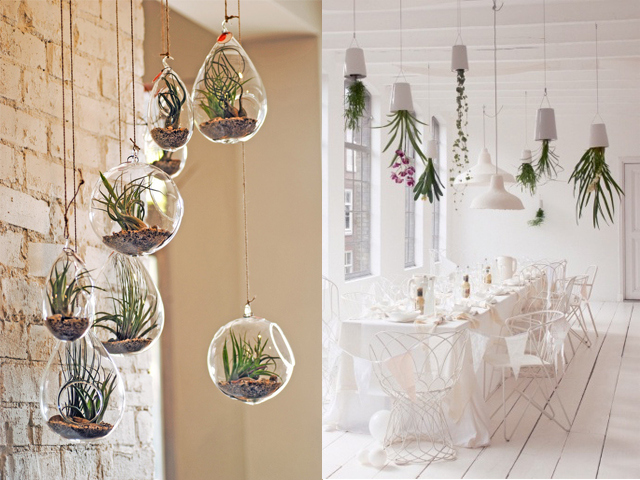 Place your air plant frame in a place where it will get indirect sunlight as well as circulating air. Mist your seeds every day but watch for water droplets that do not evaporate. Even a small amount of standing water will encourage algal growth that will choke your air plants. Use dilute fertilizer as above every week. When your seedlings are about an inch high it is time to transplant them to your favorite location. Air plants come in a variety of species, many of which produce colorful flowers. In the section entitled Tillandsia we will describe the types of air plants available and how to arrange them for adding a touch of tropical color to your garden, home, or workplace. 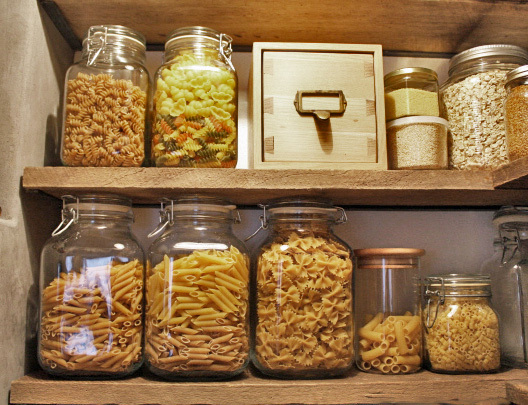 The good thing about these jars is that they’re easily adaptable to any kind of decoration. You can use them in the kitchen, bedroom, bathroom, living room… awesome, right? Before, the apothecary jars were just used by druggists to hold pharmaceuticals but nowadays you can use them to hold things like makeup, candles, flowers, candies, it depends on you and your imagination. We’re going to show you how you can make one out of things that you probably already have at home. 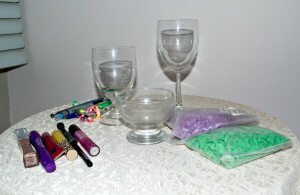 Materials: Drinking cups (different sizes) and decorative rocks. First, add some of the rocks, one layer. Then, add a second layer with another color. Finish it with a last layer. You can always mix the colors, add more, use just one, whatever you want. Use it to put your makeup or pens. If you want a taller apothecary jar just glue two cups together. Enjoy your apothecary jar! 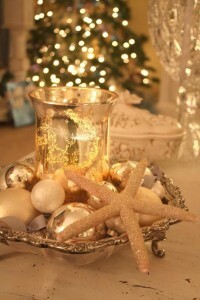 Remember that you can adapt them to decorate any part of your house. 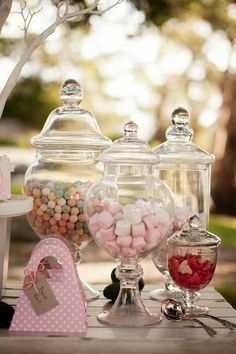 The most popular use of apothecary jars in many homes is for candy storage. 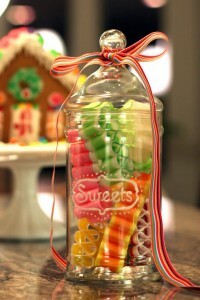 Even a simple clear glass jar can look very pretty once it’s filled with all kinds of candies of different colors and shapes. They can be placed in the kitchen, or in the living room, in the bedroom or even in the home office. 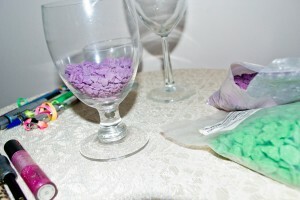 The candy color can match or contract with the room’s color scheme. Cookies can stay fresh longer in apothecary jar. 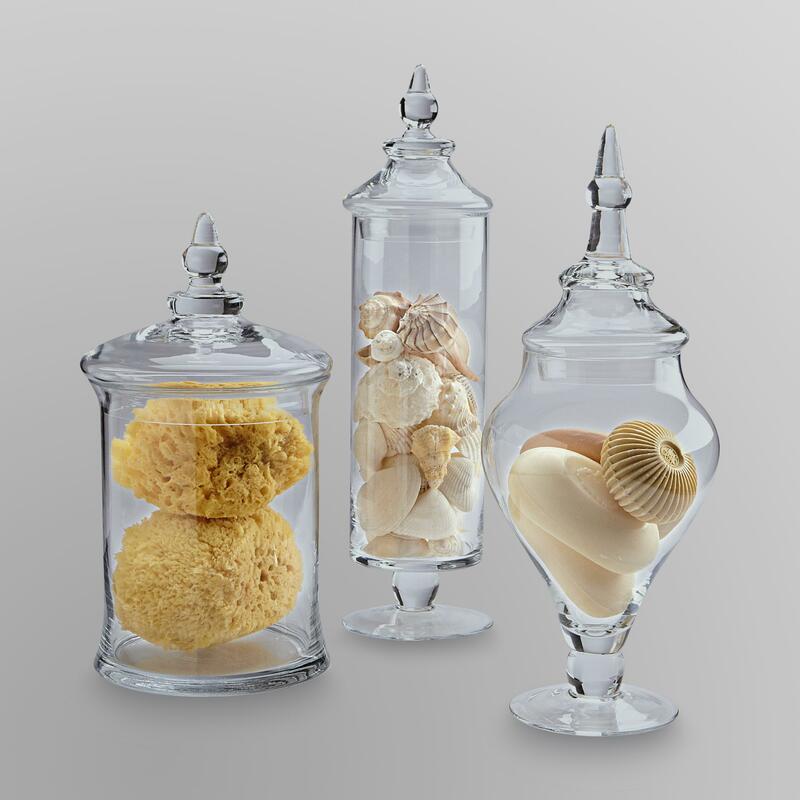 Whether these jars are plastic, tin, ceramic, or glass, your cookies will surely maintain its freshness in apothecary jars. Pastas in all shapes can stay fresh and yes, pretty when they’re on display. Apothecary jars are perfect for storing coffee beans, tea bags, sugar, powdered creamer or milk. These are apothecary jars that come in a pretty set meant for storing these. 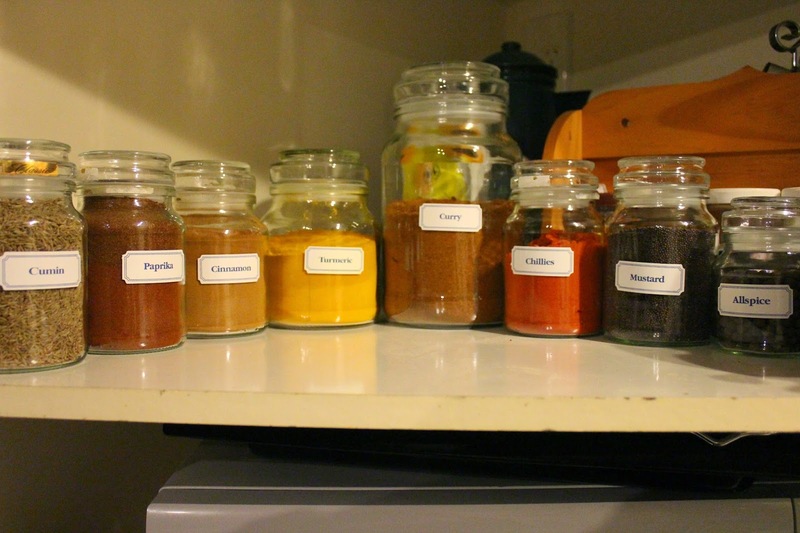 Smaller versions of apothecary jars can serve as the perfect spice keeper. When they’re all lined up, these cute jars with spices of all colors will no doubt, look very pleasing in your kitchen counter. Apothecary jars are not just great for edible items – they’re great for keeping cotton balls and cotton buds and other bathroom essentials too. You can also put some potpourri to make the bathroom smell good. Or throw in some make up brushes too. Apothecary jars with bell-shaped lids and fancy knobs can work well for this purpose. Whether you make your own candles or use the ready-made candles, apothecary jars will make perfect candle holders. They’re safer and prettier than regular candle plates. You can put small candle pillars, tea lights or votives in your jars. The soft light it will emit will give the room a beautiful white glow. Large-sized apothecary jars will make perfect holders for Christmas balls, small trees and other holiday ornaments. They are more of an ornamental décor than a keeper. They will look just right and wonderful for a table centerpiece. Throw in some pebbles, pour in some water, and arrange some pretty flowers. Voila, you now have a one-of-a-kind flower vase. You can also try to put some different colors of moss for a more unique looking flower arrangement. Instead of using a regular bonsai pot, try using an apothecary jar for your bonsai tree. Bring the lovely outdoors into your home by making a terrarium in an apothecary jar. Find some rocks, charcoal, potting soil, small plants, and moss. Simply layer all of the items in the jar one at a time. Then start planting. Add more rocks, wood and moss to make it lovelier. Spring is here and soon it will be summer. Time for enjoying the garden. What tools will you need to turn your garden into a showplace that the neighbors will envy? That will depend on several things. Let’s start and proceed from the ground up. What is your soil like? If you’re lucky your soil will be soft and easy to dig. Unfortunately that is not always the case. In some places topsoil was removed and sheepsfoot tampers used to pack down the soil before house foundations could be built. This made the houses stable, but made the soil good for nothing but patios. If, however, you are determined to have a garden, do not despair. If you are young and strong, get a hoe .If you are older or not a big fan of the gym, consider investing in a hand held battery driven cultivator. If you are dealing with a lot of land, you will need the kind of cultivator you can ride on. To decide what to plant and/or what fertilizers and soil amenders to use you will need to measure your soil pH. Soil pH meters and test strips are available at hardware and garden shops, or you can try homemade methods that are beyond the scope of this article. Commercial soil amenders and fertilizers are available for various soil types. If your soil is clay you will need an amender to break it up and soften it. Different plants need different types of fertilizer, and the same species can need different types of fertilizer during its life cycle, so do some research. Packages of fertilizer have numbers telling you what percent of nitrogen, phosphorus, and potassium they contain. For instance, 10-15-12 would contain 10 percent nitrogen, 15 percent phosphorus, and 12 percent potassium. Most plants thrive in a slightly acid pH of 6.0 to 6.5, so if your pH is below that or if you have a plant that prefers a more alkaline (higher) pH, you will need to add limestone to the soil. If you live in a cold climate and need to plant your seeds indoors, buy some flats or small clay or plastic garden pots. Or you can save egg cartons and plant a seed or two into each compartment. A potting bench in a crafts room or service area of your house makes a good place to work. Probably the largest gardening tool in the world is the greenhouse, which is great for creating a whole environment for growing seedlings for transplant or exotics in a tropical setting. If you intend to plant trees* and bushes you will need a large shovel.It can also be used for digging trenches for vegetables. The kind with the pointed end is good for digging into soil. 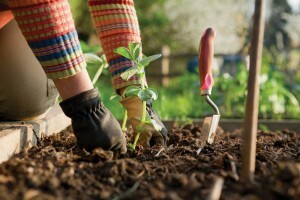 Smaller digging tools are good for planting seeds,vegetables, bedding plants, and bulbs. (Some gardeners swear by bulb planters, but a small digger will do). An inexpensive ruler can be used to ascertain the right depth for planting. To rid your garden of weeds you must eliminate their roots. Otherwise they will grow back. Larger weeds can be pulled up effectively by hand, but who wants to wait that long? To catch them early get a weeder. It has a handle at one end and a sharp, inverted point at the other for digging out those annoying weeds by their roots. If you have a small area such as a rooftop garden, a watering can will suffice for providing moisture. For hanging plants a small watering can with a long spout will enable you to reach them. For plants on the ground, get a gallon sized watering can to keep from having to make too many trips to the spigot. For a larger area a hose will do, and has the added advantage of allowing you to attach a fertilizer sprayer. Attach a nozzle to allow you to control the size of your spray droplets. This is especially important for watering seedlings, which can be destroyed by too heavy a flow of water. When your trees and bushes begin to thrive, you will soon need to trim them. A small pair of clippers designed to be held in one hand will work at first. As your plants grow larger, a larger hedge clippers, designed to be held with both hands, will cut larger branches and help you to maintain an even hedge. In the autumn most trees begin to shed and you will need a rake to clean up your lawn or garden. For leaves an inexpensive rake with aluminum tines will do. If it is windy and your trees shed twigs all over the yard, consider a sturdier rake with steel tines. Which brings us to the subject of composting. Special tools are not strictly necessary, because old leaves and garbage will naturally become compost if you simply pile them into a corner, but that can appear messy when you have a dinner party out on the patio. Special composters are not only neater, but allow you to aerate your compost by turning a handle. The sides are designed with open spaces to allow air to circulate through your compost. If you do use the pile in the corner method of composting, a pitchfork can be used to aerate your compost. Get a long kitchen thermometer to measure your compost’s inner temperature. If you have the space a garden shed is a good idea for holding all your tools. If not, they can be stored in your garage or other storage space. Small tools can be stored in a bag designed for that purpose. Gardening bags have many pockets for holding small tools and packages of seeds. They make it easy to carry things around your garden and put them back while staying organized. So take a moment to consider what your garden will need. What kind of soil and climate are you dealing with? What do you want to grow? And where? Planning ahead will ensure that you get the tools you will need for your successful garden. Mr. and Mrs. Potato Head, Lego bricks, Video Games, and all sorts of geeky toys and gadgets – these are certainly not your everyday wedding decorations. But they can be. Toys are the hippest things in the history of pop culture. 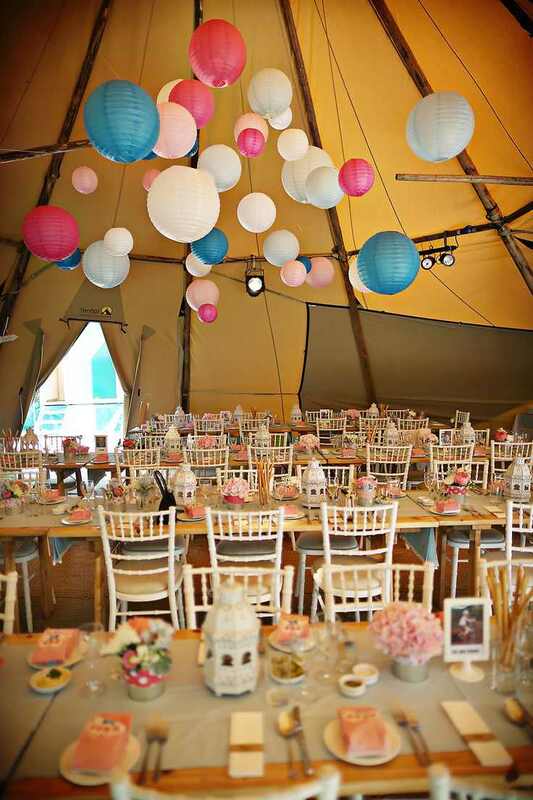 With just a few touches of fun glam and a bit of quirky imagination and you’re on your way to a fun wedding decked out with toys. 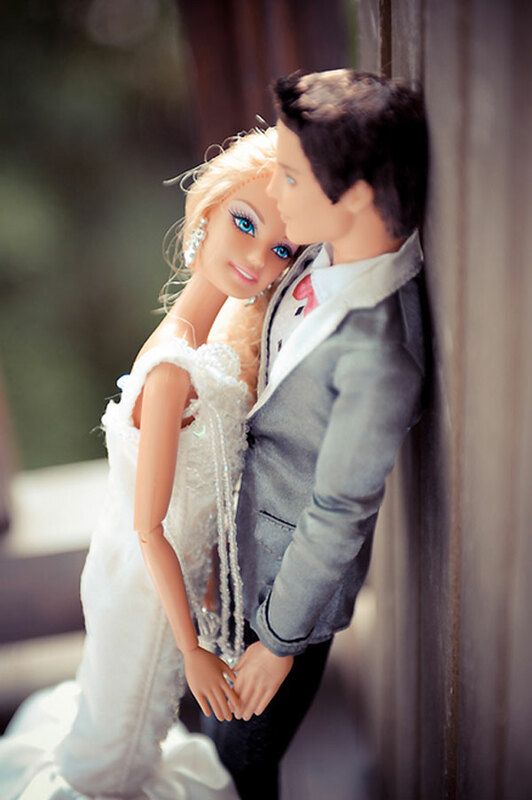 Barbie-and-Ken themed weddings can go from Hollywood glam to beach vibe feel. The bride can dress up like Barbie in a princess ball gown embellished with crystals on the neckline and waistline – and her bridesmaids can dress up like the other Barbie dolls bridesmaids. You can don the same dress and the same flower bouquets. You can choose pinkish blush and icy blue lighting. The flower girls can also dress up like Barbie’s little sister. Barbie and Ken can be used as adorable table centerpieces. 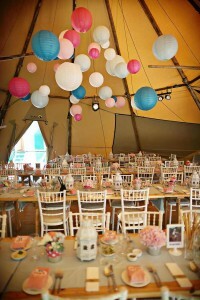 Add some pink and pearl white balloons to make the place like dream story land. Use back-lighting with a tinge of blue to create a dream-like feeling. 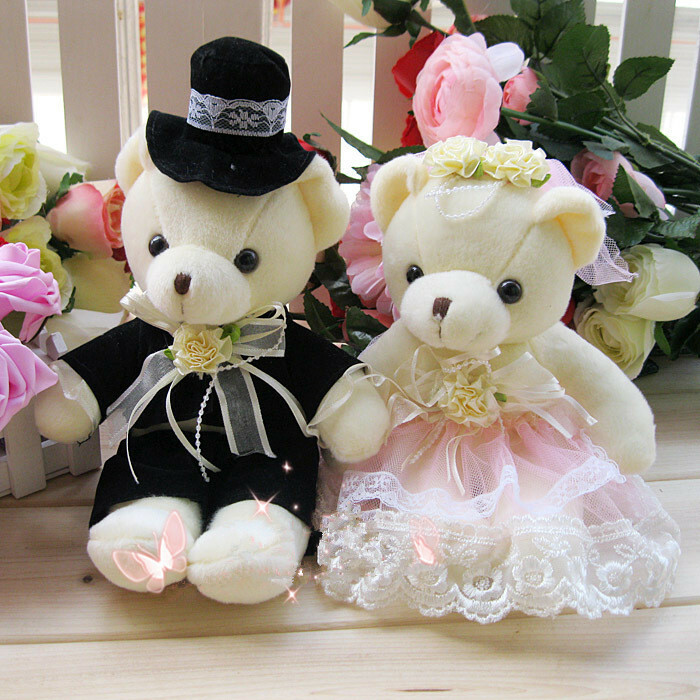 Cute wedding teddy bear stuff toys come in different sizes – from the big huggable ones to the teeny keychain type. These cuddly stuff toys can festoon your wedding car, bedeck your table centerpiece, embellish your wedding cake and adorn your dessert table. Add some stuffed flower toys or fresh flowers to your decorations. 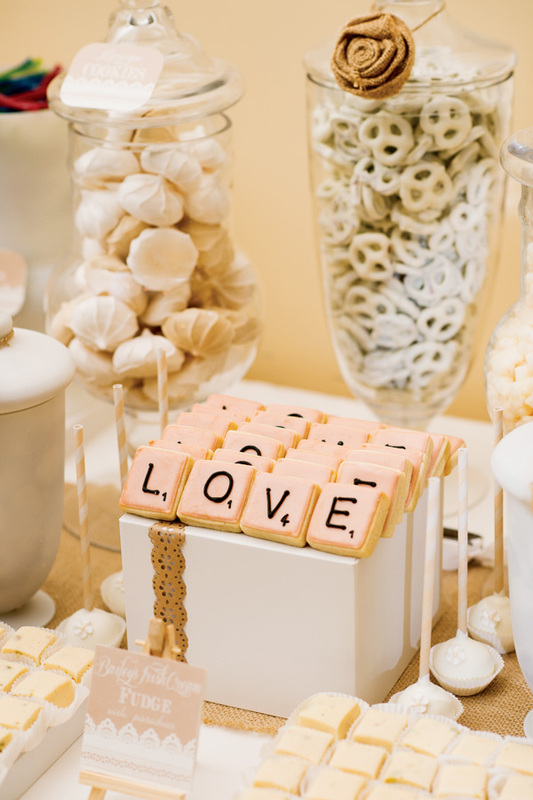 Use pastel baby colors to add a sweeter appeal. Add some splashes of stuffed heart toys too. You can also bring Mickey Mouse and Minnie Mouse in your wedding entourage. Use stuffed dolls and animals to come up with a stylish wedding cartoon bouquet – embellish it with fresh flowers or artificial ones. How’s that for a cute and cuddly wedding bouquet? 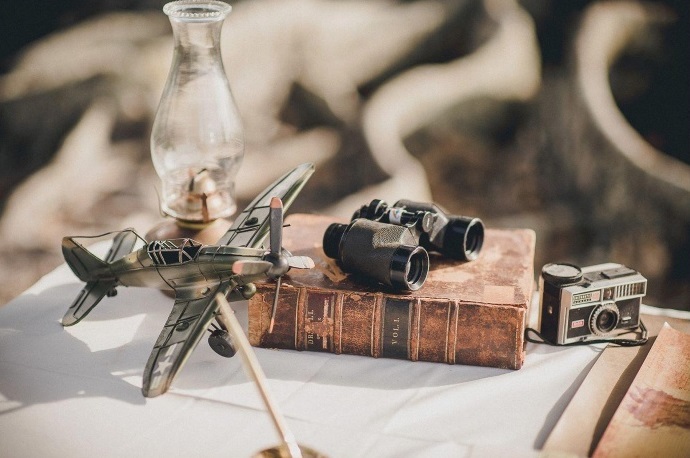 You can add toy metal airplanes to your wedding decorations to make the boy in your man happy too. 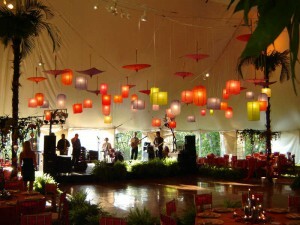 Drape the wedding venue with hanging airplane and strings of flowers. Use toys for the big boys (and girls) to adorn your wedding. Integrate fun gizmos and gadgets in your wedding ensemble. Like a pair of functional USB cuff links. 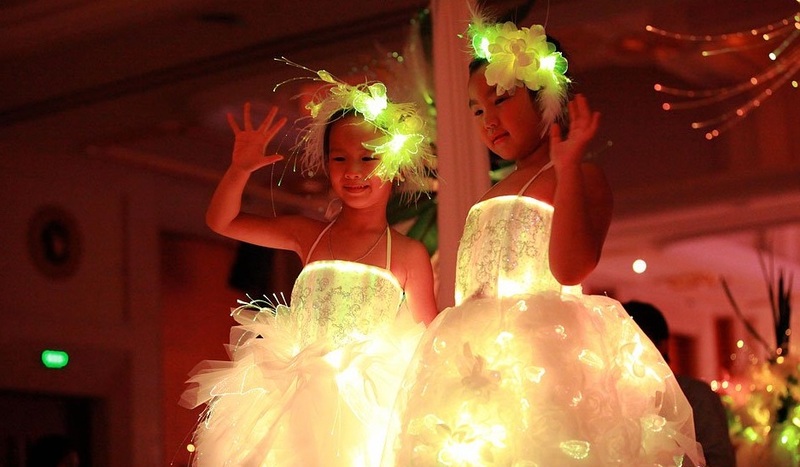 Or gold-tinted LED lights in your wedding gown – to mimic a candlelight glow. Try it in your partner’s tuxedo too. That is if he doesn’t fancy a spinning bowtie. A champagne bucket kitchen timer slash fridge magnet is an example of fun gizmo wedding giveaway. An apothecary jar can be anything you want it to be. It can be a storage jar for your coffee beans or homemade cookies, a canister for bath salts and sponges or a hurricane candle holder or a votive. 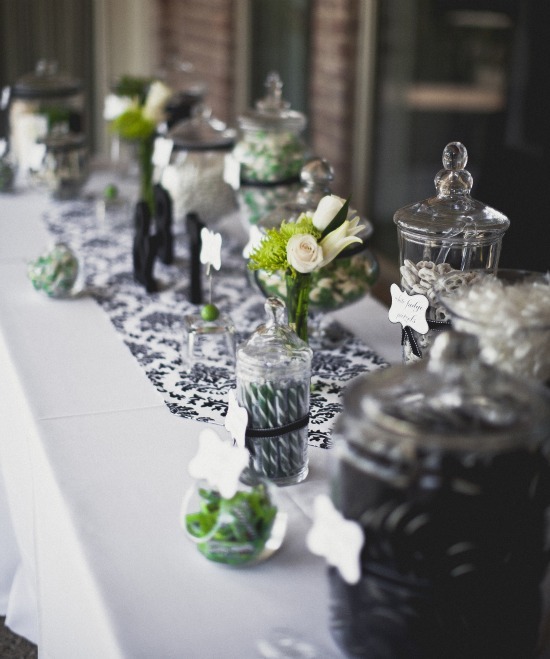 Using apothecary jars as candle holders for your wedding is an excellent idea. Think about the soft candlelight it will emit during the ceremony or even during the dinner reception. Do you like what you see? Candles in apothecary jars exude a charming, romantic and peaceful vibe. 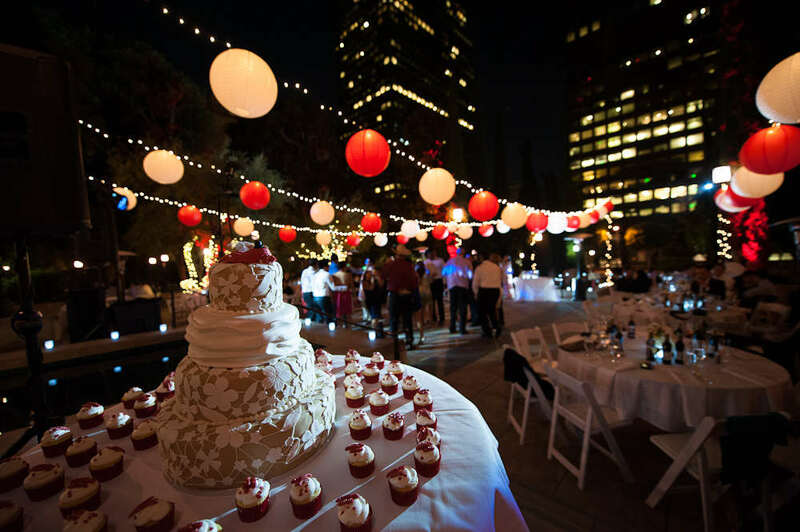 If your wedding falls on a certain season, like Christmas for example, create something that will tie in the Christmas feel. Of course, candles are best items for Christmas. Thrown in some pine cones—sprayed in silver or gold. You can also spray it with your wedding color theme. Arrange it in an apothecary jar and put the candle in the middle. Add some hollies and berries if you like. If your wedding falls on a spring, throw in some colorful Easter eggs or pastel colored stones. If it’s during autumn, put in some Halloween candies before putting in the candles. Wineglasses can have a different twist. Look for the less expensive kind in a dollar store. 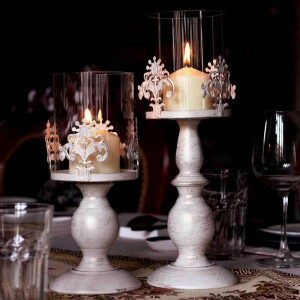 You can convert these wine glasses as apothecary jars to hold your candles. Tie a bow around it. Or some rustic rope. Throw in some sand or glass colored pebbles. Put in the candle. Light it up. And voila. 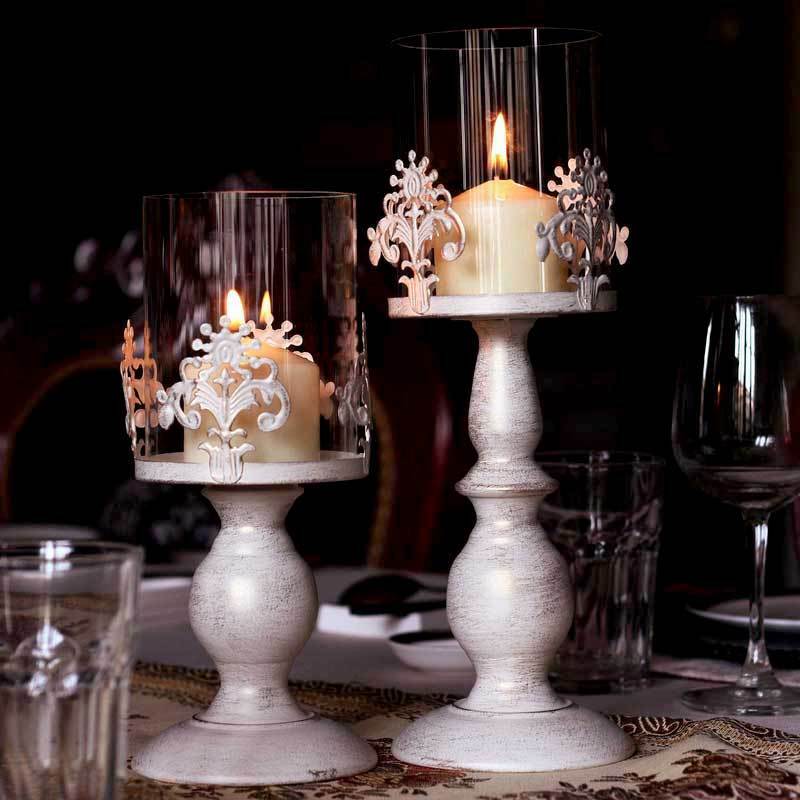 You now have an elegant and easy to make candle holder. 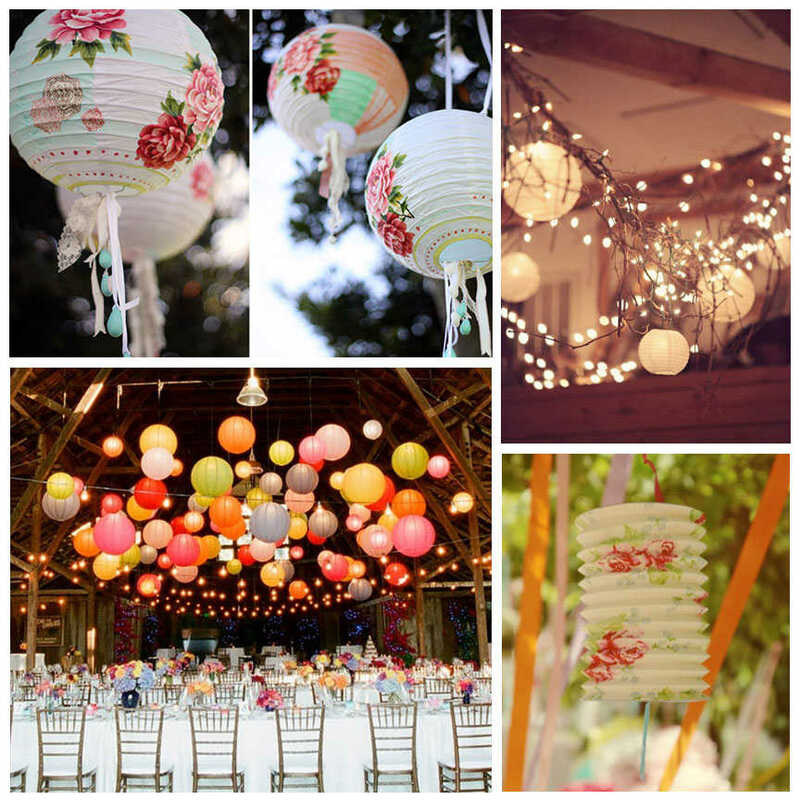 Scrounge the thrift stores or your attic for old lamps or even street lamps. Refurbish them by paint them with black or white. Or make it look rustic or shabby chic depending on your wedding theme. You can also transform your old lamp fixtures into candleholders. Put in some candle sticks in varying heights inside the candle lantern. 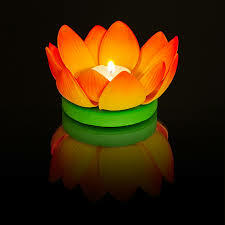 Finding colored candles is easy. But finding colored apothecary jars is another story. But consider yourself lucky to find one. 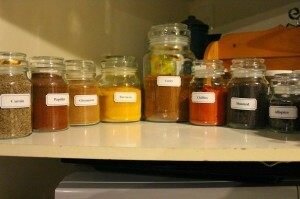 Use colored candles for clear apothecary jars and use the standard candlesticks for the colored apothecary jars. 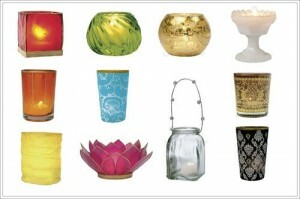 Get jars and candles in different sizes and heights to add variety. You’re luckier if you find textured colored apothecary jars with lines and dimples. They add a quirky yet elegant touch to it. Using scented candles is another way to add to the whimsical feel. Just make sure it won’t make anyone get the sniffles or the itch. 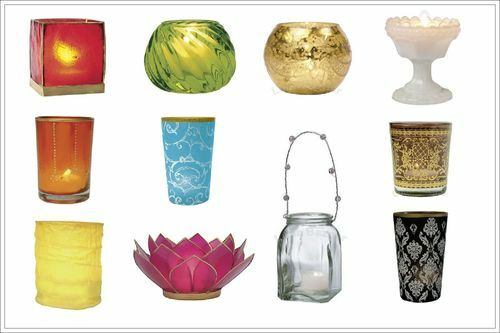 Colored, textured jars and scented candles are definitely appealing to the senses. What’s better than a candle in a glass jar? A candle in a hanging glass jar. Find the McGuyver in you and make a contraption that holds a small light apothecary jar. Prettify it with colored bows and ribbons or sprigs of flowers. 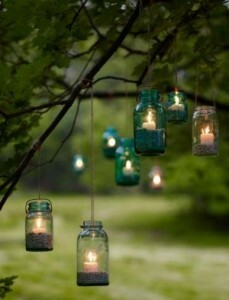 Light the candles up and hang the jars. Definitely whimsical and romantic. 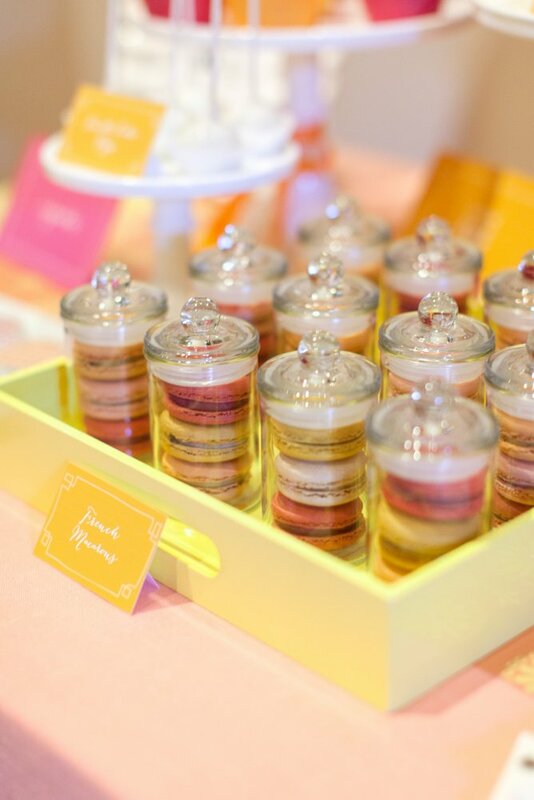 Apothecary jars should get all the hoot and the whoop as a unique wedding favor – they’re pretty to look at, they’re functional, and practical – you can reuse them, and they’re definitely easy to fall in love with. What’s not to love about these cute apothecary jars? 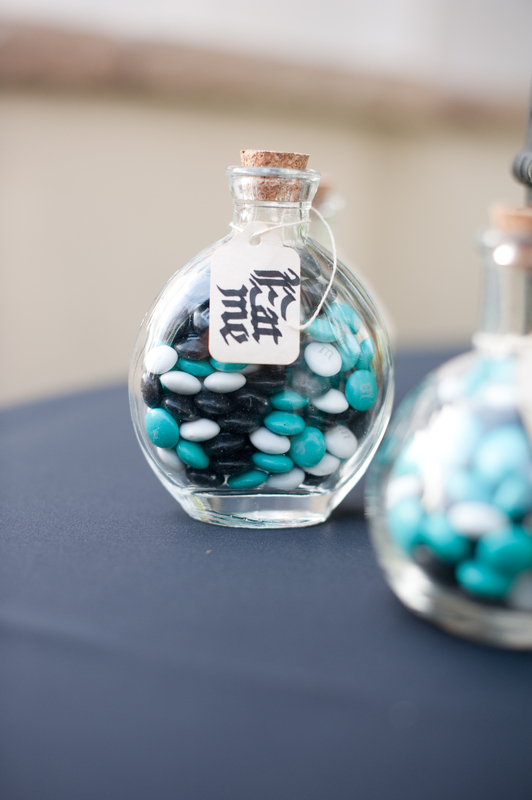 Depending on how you dress them up, or what you put inside them – the apothecary jars can be great wedding favors for just any kind of wedding. From rustic to formal, to classic to laid back. 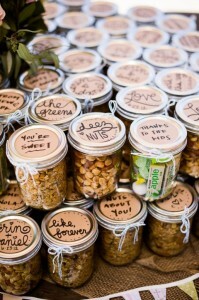 If you want to make a unique lasting impression on your guests or if you want to personalize your wedding favor that you can call them your own, get those jars and have fun filling them up. There are a lot of apothecary jars to choose from. Think about what you want to put inside and choose the appropriate kind of apothecary jar. Some have hinged lids with a silver metal air tight locking gasket – this is perfect for edible items. 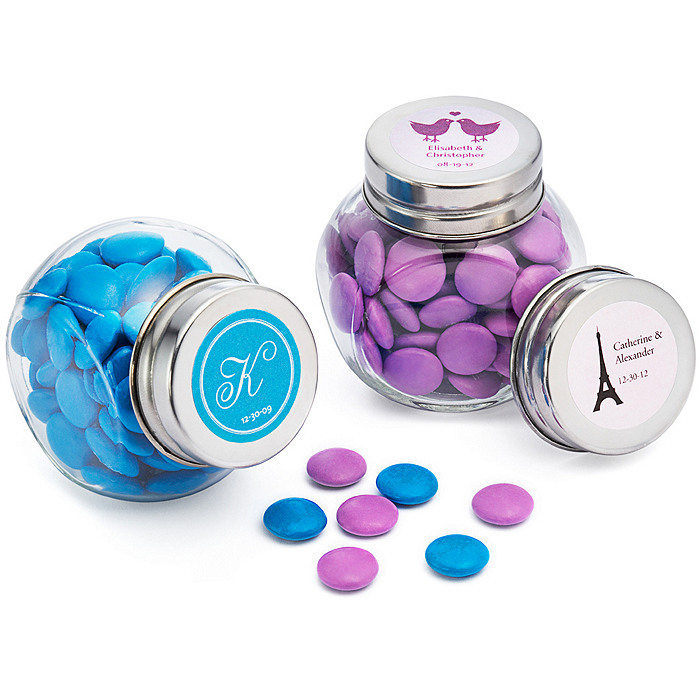 Some are just the regular glass candy jars with covers – they’re perfect for ornamental stuff. And other have small water spout – just right as beverage jars. So what do you put inside them? The possibilities are endless. What comes to mind when you see clear jars? Colorful candies and almonds and chocolate nibbles, of course. You can put pastel-colored almond wishes inside them too. Customize M&M’s with your names – you can pick out your own color. Throw in some silver Hershey kisses. Or get the pastel-colored ones that come out during spring or the red and green ones that come out during Christmas season or the orange colored ones during autumn. Try throwing in some spice – like rosemary, cumin and thyme. Perfect visual or the spice of life that comes along with marriage. You can put your homemade jams and jellies in there too. Speaking of homemade, fill them with your favorite family recipe bite-size brownie bars. Or for a healthy twist, put in some organic tea leaves. Slip instructions on how to make a relaxing cup of tea. 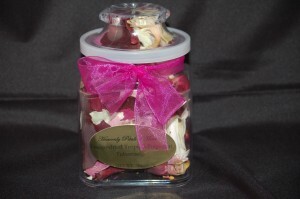 Tie a colorful bow around the jar and put small ribbon roses through the ribbons for a perfect finish. 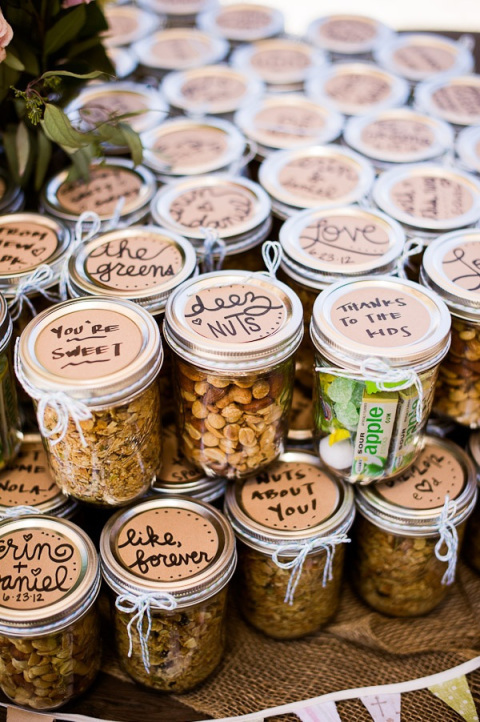 For rustic weddings, toasted nuts are fun fillings for those cute apothecary jars. Walnuts, pistachios, cashew nuts, peanuts. Mix them up for more flavor, more texture and more fun. 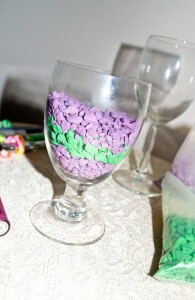 For bigger jars, you can put in some flavored popcorns – add some dashes of color by putting in the colored popcorn. 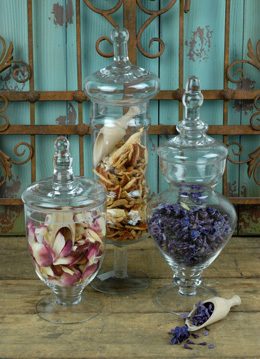 Fresh flowers or dried potpourri flowers are perfect fill-ins for those apothecary jars. And it can also serve as a DIY floral table centerpiece that can be also double as a wedding favor. Create your own mini forest or seashore by converting the jar into a terrarium. Put some cacti of all shapes and sizes. 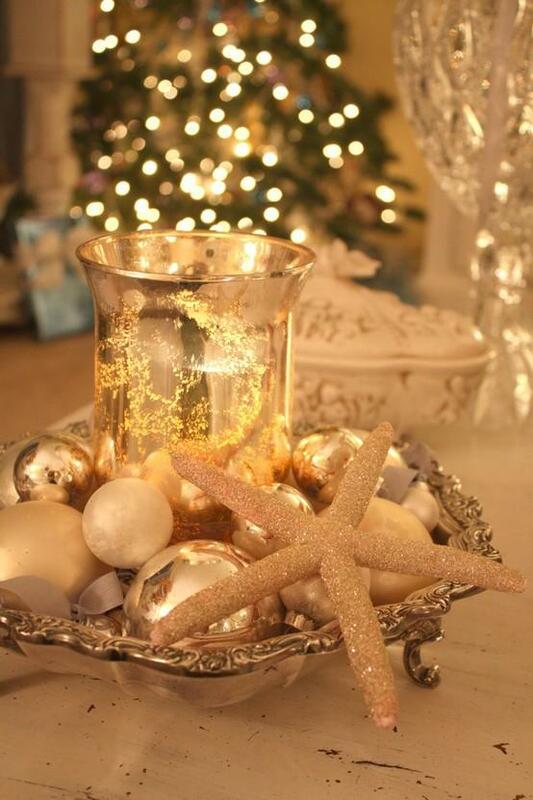 Pour some sand and arrange shells and small drift woods to create a mini shore. 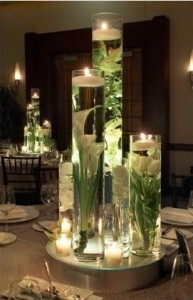 Tall vases are wonderful for making a dramatic statement.What statement would you like to make? Have a hobby you would like to show off? Enjoy holidays and changing seasons? 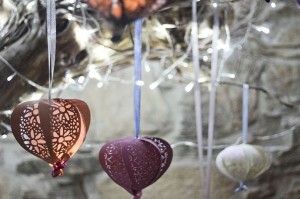 Maybe you like themed decorations that fit in with each room individually. Get ready to let your imagination and creativity take off. Ever wonder what to do with a large collection of small objects? Try a three or four feet tall clear glass vase. Fill it with your matchbooks from all over the world. Stand the vase on the floor to add some interest to a boring corner. Collections of shells and sea glass go great in tall clear vases, too, especially if you happen to live near the beach or choose an ocean theme for decorating your home. Rock collections can find a good home in tall clear vases as well. Gift wrapping paper and ribbons seem too pretty to throw away, but how many times can you actually use them? Collect all your pretty bows and shiny paper and arrange them casually into your vase. As they get old remove them and replace them with wrapping from the latest birthday or holiday. 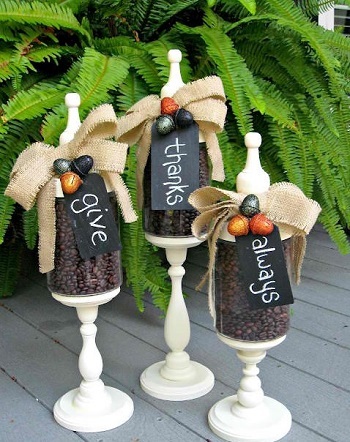 Pine cones are a fun thing to fill a tall clear vase in the mountains or as a decoration for the holidays. 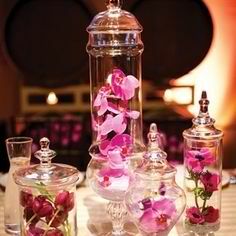 Permanent botanicals are a good idea for tall vases because they do not require water. Water would make a tall vase too heavy to lift and it would be difficult to empty when the flowers died. Standing water, especially with real stems and leaves, can get unpleasant, so take a trip to the nearest retailer where faux flowers are sold. 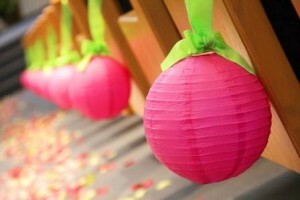 In spring use light, bright colors such as pink and lavender. Find fruit tree branches with spring flowers that will fit your spring theme as well as being long enough to stand in a tall vase.Summer warmth naturally fits well with tropical themes.Tropical arrangements lend themselves well to tall vases because flowers such as ginger, heliconia, and bird of paradise have long stems. Use palm fronds or ferns leaves to make your warm colored flowers “pop” against the green. Bamboo also comes in tall sizes and will give your arrangement a great tropical look. In the fall stand birch branches up in your tall vase and glue on faux leaves in bright fall colors. Stand inside your front door for Thanksgiving guests to admire. Long curly willow branches can also be used for big, bold arrangements, and make another good holder for fall leaves. Pampas grass with its feathery white seeds and long, straight stems is another plant that looks great in a tall vase in autumn.In winter fill your tall clear vase with tree ornaments. 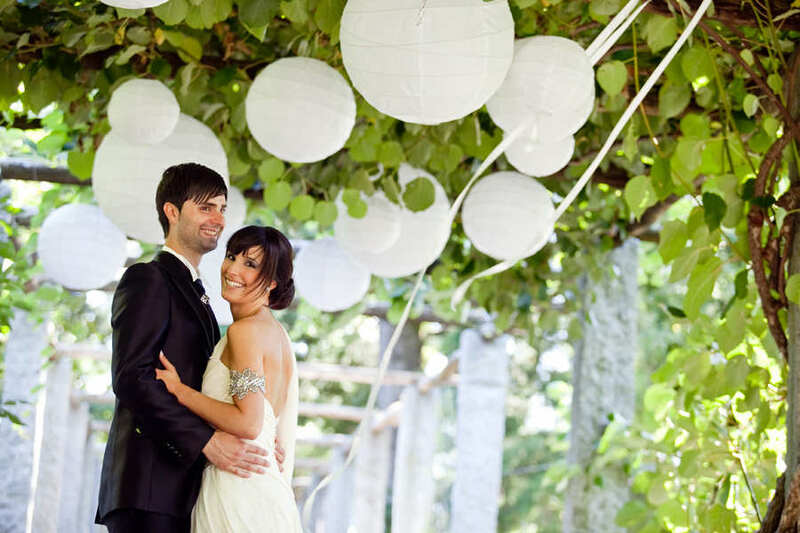 Use simple orbs for a modern look, or use more elaborate decorations for a more traditional look. Decide upon a theme such as sweets and fill with faux treats such as gingerbread men, red and white candies, or cookies. 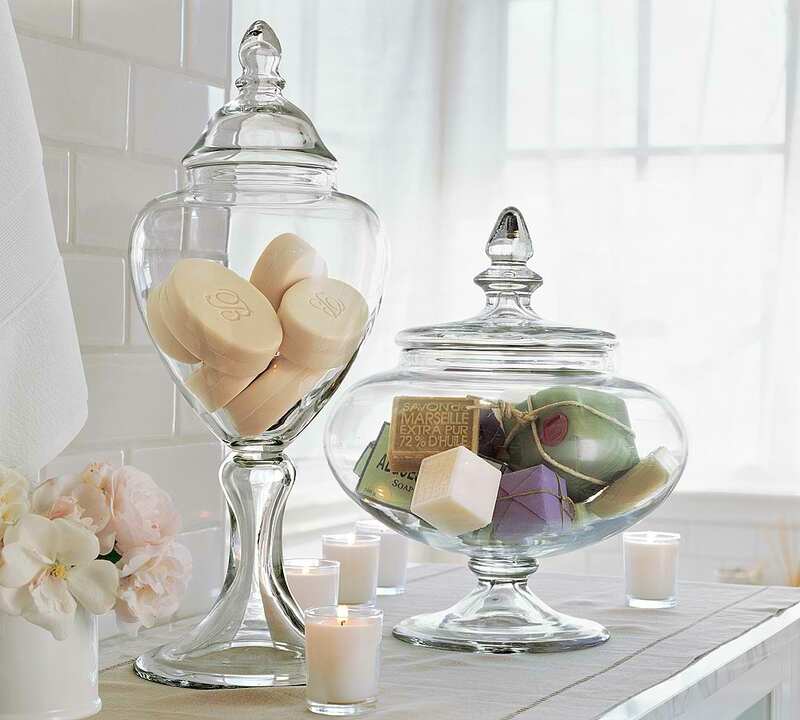 To decorate a bathroom intersperse transparent plastic orbs that shine like soap bubbles with colorful guest soaps throughout your tall clear vase. Match the soap colors to your towels to tie the look together. For your sewing room gather all those fabric remnants you’re never going to use but that are too pretty to throw away. They’ll make a lovely display filling your tall glass vase. Add some bobbins and some old wooden thread spools to support the theme. Tall ceramic vases come in all colors and textures. Fill them with tall branches such as grapevine and tie with raffia for a natural look. Find milkweed vines growing over fences. When they die carefully unwind them, taking care not to break them. Their interesting shapes go well with the earthy look of clay vases. If your ceramic vase is glazed in a bright color, make a grid of tape across the top. Cover your tape with permanent botanical ferns and place colorful flowers throughout the grid. The general rule of thumb for making vase arrangements is to have the flowers stand above the vase about twice as high as the vase, but with tall vases this can be difficult to make and to find a place for it, unless you happen to have high ceilings . Instead, try placing the same amount of foliage and flowers out onto each side of your vase. The weight will be the same, but you will have an arrangement that does not take a stepladder to make and that will not bump into your chandelier. For a simple modern look use the same color flowers as the vase. This is known as a monochromatic design. For a more traditional look use a contrasting color or several contrasting colors that harmonize with each other and your vase. Sometimes the most difficult thing to do with a work of art or craft is simply to leave it alone. Many craftsmen design their tall vases to stand as beautiful structures in their own right. But you wanted to craft your own unique design. No problem. Many community colleges, studios, and art schools offer classes in glass blowing and pottery. Learn to make your own tall vase. First take enough instruction so that you are confident enough with your new skills. Then decide where you want your new tall vase to stand. That will help to determine the size, shape, and color for your new decoration. Hold up a tape measure in the spot where your tall vase will stand. What shape goes with your interior decorating scheme? Is your furniture basically square-shaped? Perhaps some curves would add more interest. What color will match the furniture or contrast with the wall color to make your creation stand out? Are your walls painted in warm colors? Perhaps turquoise or green would make your tall vase stand out. Plan what you will make by drawing sketches of your design. When you have chosen your favorite sketch, go to it. You’ll have a work of art like no other on the planet. Judging by the name one might imagine an eiffel tower vase as a model of the famous Parisian tower, but the resemblance is actually rather vague. Actually the vases are made of glass and have a tall thin appearance, with four corners at the base to keep them steady, reminding many of the famous landmark..
Eiffel tower vases can be used for a variety of decorative purposes. The long stem can be filled with items to make it an elegant decoration in itself. Fill with California crystals and an LED light source for a romantic lwer vases themselves come in different sizes, so you can make a grouping with taller vases in the back and shorter ones in the front if your arrangement is against a wall. If your arrangement is at the center of a table, place the tallest vase at the center and arrange the shorter ones all around it. ook. 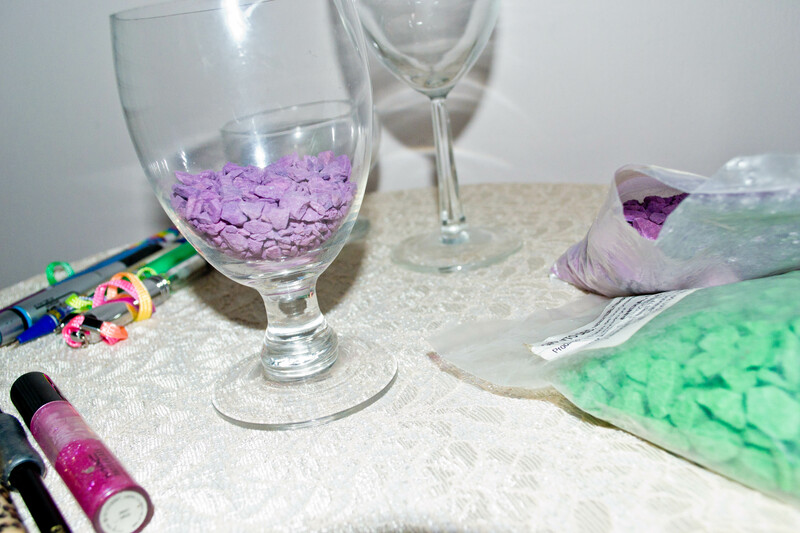 Die your crystals with food coloring or leave them clear. Acrylic “crystals” also make a beautiful filler. Powdered rainbow floral foam is also lovely. Use sand in a variety of colors for a rainbow effect. First pour in purple sand, followed by a layer of red, then orange, yellow, green, blue and purple again for a spectral effect. Some florists like to layer various media into the stems of Eiffel tower vases to give their arrangements a variety of textures and colors. Holidays are good times for filling stems of Eiffel tower vases with various colors. One florist used blue acrylics, white California crystals, and blue powdered rainbow foam for Hannukah. The same could be made for Christmas with red and green acrylics floral foam, or California crystals. For Thanksgiving use fall-colored sand for a less glittery look. For Valentine’s Day alternate pink, red, and white. Pink is also traditional for Mothers’ Day. An Eiffel tower vase filled with decorative materials can be used alone for a simple modern look, or in combination with other vases. If your grouping is going to have a front and a back, such as an arrangement of vases on a buffet table, place the tallest vase at the back and shorter vases in front . If your arrangement is going to be seen from all sides, place the tallest vase at center and arrange the shorter ones all around it. Either fresh flowers or permanent botanicals can be arranged to make a dramatic arrangement in your Eiffel tower vase. If you have filled your vase with some of the suggested decorative media above and want flowers as well, you will need a shallow bowl with a wide flat bottom. Drop floral foam into a bath of water and allow it to absorb water until it is all dark green and floating slightly below the surface. Do not push it down, but let it sink naturally. Place floral foam into your bowl and secure it with bowl tape, available where floral supplies are sold. Cover your foam with greenery such as leather leaf, allowing leaves to hang over the sides, hiding your bowl completely.Next place some of your favorite flower into the foam, arranging the stems to make a round shape. Add smaller flowers, such as baby’s breath, throughout, just below and to the sides of the other flowers to fill in space and frame your larger flowers. 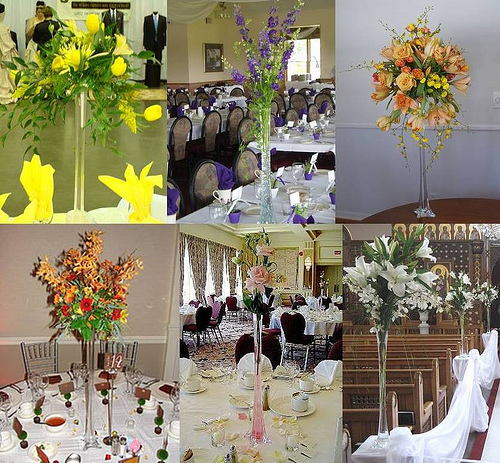 Flower colors can be selected on the basis of color for the appropriate season or holiday. For spring choose colors such as pink and lavender. For summer choose some yellow or blue. For autumn choose orange and brown. White is good for winter. Pick blue for Hannukah and red for Christmas. For the latter add some pine needles or cedar. When your bowl arrangement is complete place it onto your Eiffel tower. Add amaranthus to the sides of your bowl and drape it over your vase for a poetic effect. You can do much the same thing with permanent botanicals , buy, of course, they will not need a water source. Glue styrofoam into your bowl and begin covering with permanent foliage. Add your flowers in the same way as for your fresh flowers.. Place your bowl on top of your Eiffel tower and you have your finished arrangement. If you prefer you can fill your vase with plain water and arrange longer stems into it. The advantage of this kind of arrangement is that the stems will absorb more water all through their lengths. Some flowers that work well for this kind of arrangement include roses, lilies, and allium, all of which grow on long stems. Tangle their stems with a few stems of leather leaf to hold them in place, then place all the flowers and leather leaf into your vase at once. Remove the stems every few days and replace the water with fresh water. 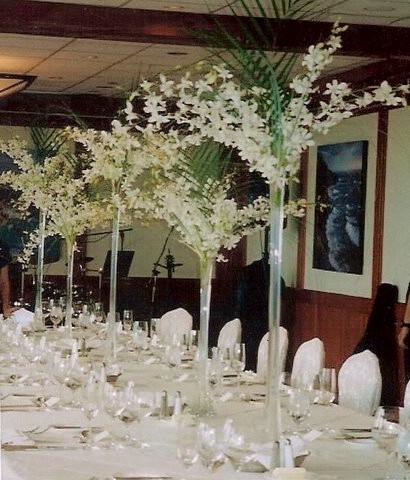 Eiffel tower vases are often used at wedding receptions because the flowers can be high enough not to interfere with conversations that take place across tables. Choose the tallest Eiffel tower you can find, fill it with water, and soak spherical floral foam in water. Again, allow the foam to fill completely with water without touching it. Pave the foam all around with flowers such as Kermit poms and place your sphere onto your Eiffel tower vase. Rotate the sphere from time to time so that all the flowers are exposed to the water in the vase. For a round table use one arrangement in the center. 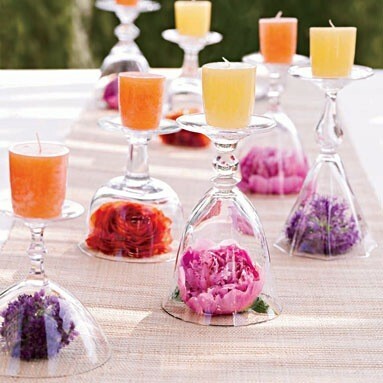 For a rectangular table place a row of vases into a line down the center. 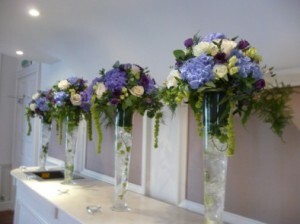 Mirrors or runners will emphasize your arrangements and give them depth. Another way to use Eiffel tower vases in a row is to fill them with water and place curly willow or a decorative grass such as bear grass or steel grass into each one. Now bend your curly willow or grass and place the top end of each into the next vase in line, so that your line of vases will all be connected. These are only a few things that you can do with your Eiffel tower vases. Gather your ideas and materials and make your own individual creation.